Publisher's Note: Products purchased from Third Party sellers are not guaranteed by the publisher for quality, authenticity, or access to any online entitlements included with the product. Do you find biochemistry daunting? If so, this time-saving guide offers all the help you need. 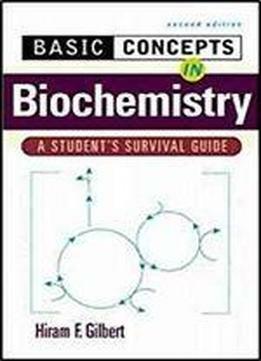 Compact, yet comprehensive, the second edition of BASIC CONCEPTS IN BIOCHEMISTRY breaks down the complexities of biochemistry into jargon-free, easy-to-remember steps that show you how biochemistry works.And unline reviews that emphasize memorization of facts, this book helps you master the topics that students find most difficult, building your understanding with explanations in everyday language. You'll comprehend the material and feel more comfortable applying it.Along with enhanced figures, the new edition contains two new chapters - one that outlines the concepts of membranes and membrane proteins, and another that focuses on signal transduction pathways.OTHER FEATURES TO LOOK FOR:Building-block format, providing clear connections between easier and more difficult topics Empahsis on concepts - not facts - for a handle on any problem Summary boxes, diagrams, and tables that speed review and clarify key points.BASIC CONCEPTS IN BIOCHEMISTRY has just one goal: to review the toughest concepts in biochemistry in an accessible format so your understanding is thorough and complete.Look for these other BASIC CONCEPTS titles: Cell biology Embryology Immunology Pathology Pharmacology.